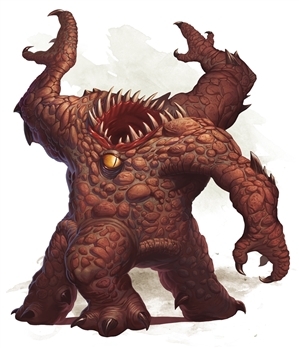 This week’s encounter is The Hungry Xorn, a social encounter with a monster that would rather barter than fight. Like most elementals, a xorn is neutral in alignment, but unlike most of its elemental cousins, it’s quite a gossip! 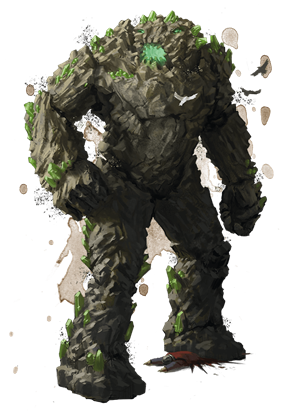 As beings of elemental earth, xorns tend to live in natural caverns, the Underdark, and abandoned mine shafts, but they can also be found in old underground dungeons, if their burrowing causes them to break through its natural walls. And their natural habit is, of course, the Elemental Plane of Earth, where massive geodes intersect at impossible angles with infinitely criss-crossing cave systems. Exploring a subterranean realm is no mean feat for the player characters. Surviving the deep places of the earth requires ample supplies, sufficient information about monster movements, and the knowledge of where it’s safe to rest and recover from your wounds. All of these things are in short supply in a dungeon’s darkest depths. That’s where the xorn comes in. As a gossip and an information-monger, xorn possess many things adventurers need. As treasure hunters and tomb-pillagers, adventurers are laden with the things that a xorn wants most: sweet, sweet gemstones! Xorn delight in devouring precious metals and gems, savoring the delightful melt-in-your-mouth texture of gold and the satisfying crunch of a nice, crispy diamond. Typically, xorns ignore organic creatures, since they can’t digest their weird, juicy flesh. However, a xorn’s preferred diet of precious stones and metals can be hard to come by on the Material Plane, and hungry xorn will search out adventurers laden with gold and jewels in order to barter… or steal, if pushed too far. This social encounter can turn ugly. If it does, it’s best suited for 4th-level characters, but it can be scaled up to challenge a higher-level party. While exploring a subterranean cavern or dungeon, or an extraplanar geode on the Elemental Plane of Earth, the characters encounter a starving xorn. In order for this encounter to work perfectly, both the characters and the xorn need to possess one thing the other wants. Odds are, the characters have gold or jewels that the xorn wants to munch on. The xorn is brimming with useful information about the dungeon the characters are exploring; they need to want what the xorn is peddling. How can you get your characters to need information in a dungeon? It may sound simple, but your players will thirst for information when they need to achieve something but don’t know how to achieve it. This requires the characters to have a clear objective (or several discrete objectives) within the dungeon, like finding and rescuing some captives, finding a magic item, or finding and defeating a villain. A lot of these objectives revolve around finding something, which means that a good bit of knowledge for a xorn to have is the location or a secret door, the password to a magically locked passageway, or the proper path through a trapped corridor. Or, maybe a red dragon lives in the dungeon and sits atop a pile of gold. The xorn can’t get the gold itself, but it is willing to burrow a back door into the dragon’s lair if the characters agree to split the gold with it. Going beyond simply finding a person, object, or path, perhaps the players need to learn how to do something. Consider a dungeon in which the players need to defeat a major villain of their campaign, but also know that the villain is nigh-invincible, and they must discover how to harm him regardless of his invincibility. The xorn might know a secret weakness that they could exploit, or the location of a magical blade that could cut through the villain’s invincible armor. Consider your own dungeon, and your own campaign’s circumstances. What information do your players need that this xorn could possess? The characters encounter a xorn while exploring a dungeon. This xorn is initially quite cordial, offering to barter for information in exchange for some of the gold and jewels that the characters are carrying. If it is refused, it resorts to sarcasm, insults, and even plain-faced threats. If these tactics don’t work, the xorn snarls and attacks. A bizarre creature emerges from the stone wall of the cavern, no more than 10 paces ahead of you. It doesn’t burst through the wall like a burrowing mole, but rather glides out of it like a fish glides through water. The creature itself seems to be wrought from stone, and has a body shaped like a clay pot, with a mouth filled with razor-sharp teeth on top. It trundles across the floor with three clawed feet, and scratches at its bulbous body with three clawed hands. This creature plods over to the opposite wall of the passage, then jumps in, smoothly entering the stone without displacing even a single pebble. This creature is a xorn, with the following change: it can speak and read Common, Dwarvish, and Undercommon, but cannot write. This xorn is starving. It hasn’t been able to gorge itself on a good silver ingot or an overflowing clawful of emeralds in days. However, it can smell the precious metals and stones on the adventurers, and is prepared to barter in exchange. The xorn has learned three important pieces of information about the dungeon. One significant clue, one silly clue, and one vital clue. You should create three clues yourself that fit your campaign, your adventure, or your dungeon. If the characters give the xorn an additional 1,000 gp, it then shares the vital clue. If the characters were reasonably kind to the xorn throughout this encounter, and fed it a total of 2,500 gp worth of gold and jewels, it offers to accompany them as long as they’re underground. At Higher Levels: Higher levels don’t inherently mean that characters have more money, but this tends to be the case. Multiply the gold amounts by 2 if the characters are at least 11th level, and by 4 if they’re at least 17th level. This is more of an art than a science, and should be tailored to your party. If the characters do not throw at least 500 gold worth of coins and gems at the xorn now, it attacks. The furious xorn attacks the adventurers who refuse to give it the treasure it desires. Its tactics are simple: it tries to attack one creature while staying away from as many other characters as possible. Then, after attacking, it escapes into the cavern’s stone walls while provoking as few opportunity attacks as possible. It repeats this process on its next turn by gliding through the wall, hopping out, attacking, and trying to flee back into the stone wall. At Higher Levels: If the characters are at least 11th level, the xorn coughs up a rough iron oil lamp out of its jagged mouth on the first turn of combat. It uses its action to desperately wail “Mom!? Help!” as it frantically rubs the lamp. The lamp summons its mother, a dao, from her palace on the Elemental Plane of Earth. She scowls at her foolish son and commands him not to waste her time on trivial adventurers, but lovingly defends her son nonetheless. The dao arrivals with her pet earth elemental. If the characters at least 17th level, the xorn produces the legendary war pick Ironfang from its mouth, holds it aloft, and uses its action to shout “Hey dad! Some adventurers are being mean to me!” The ground quakes with fell power as the xorn summons the progenitor of elemental earth: Ogrémoch. The mighty prince of elemental evil bursts through the floor of the cavern and roars at the characters with a mountainous hatred for all mortal life. If the characters gave the xorn what it wanted, it is more than happy to gobble up their gold, point them in the right direction, and part ways amicably. If the characters were kind to the xorn, and it opted to follow them and aid them throughout the dungeon, it could even reappear in later dungeons if the characters go back underground later! If the characters are at least 11th level and fought the xorn’s mother, they also find the iron lamp it used to summon her. Once per day, a character can rub this lamp and speak aloud the words engraved upon its side: dol-Xokur kobrakur. Saying this phrase transports the lamp’s bearer and up to 20 living creatures within 30 feet of them to the dao’s palace of Xokur. It sits within in a massive geode on the Elemental Plane of Earth. If the characters are at least 17th level and fought Ogrémoch, prince of elemental evil, the primordial terror is destroyed and its spirit is whisked back to the Elemental Plane of Earth, where it painfully reforms over the next 365 days. In its place, Ogrémoch leaves 10,000 pounds worth of jade, emeralds, alexandrite, malachite, peridot, and other green gemstones, worth about 500,000 gp. The xorn also leaves behind the legendary war pick Ironfang. Did you like this adventure? 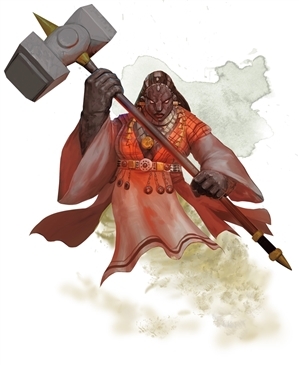 You can pick up more adventures I've written on the DMs Guild, such as The Temple of Shattered Minds, a suspenseful eldritch mystery with a mind flayer villain (for 3rd level characters). Fire, Ash, and Ruin, an expedition into a demon-infested volcano where you can ally with a red dragon and fight a balor (part of Season 7 of the D&D Adventurers League, for 11th–16th-level characters). The Cannith Code, an Eberron adventure in which you infiltrate a secret weapons research facility and bust out a master codebreaker (part of Embers of the Last War, a D&D Adventurers League storyline, for 1st–4th-level characters). All Eyes on Chult, in which the Xanathar Guild tries to wriggle its way into a position of power in Port Nyanzaru (Only available as part of Xanathar's Lost Notes to Everything Else; Adventurers League-legal, for 1st-level characters). Also, check out other encounters in the Encounter of the Week series! I love the Xorn summoning it's parents. Most of my parties would not part with that much gold without a garuntee of usefulness. You should have saved this one for April and named it "Xorn 1040: Taxation & Negotiation." I like this one. The parents give a funny little twist to an otherwise routine kill something that wants to take my treasure away. "You won't feed me? Hum. I will just summon a demi-god and a being that can grant wishes so I can be fed!" All joking aside, its a nice encounter. It gives a major reward to the kind of heart, as they can get the solution to a huge issue (Like getting out of the underdark). This results in a very unique experience. Unfortunate enough that my party is exclusively above ground (Koboldphobia. The last DM put in so much chest kobolds. They were not that good at balancing, lets say). Hm... what would you want to see in a race guide? Can the xorn speak Terran too, along with the other languages? I love this, evokes memories of Gurgi from “The Book of Three,” by Lloyd Alexander. Just ran this and it was hilarious! They kept trying to convince him that 50gp was enough and Xorn was not having it. It ended up killing the rogue but they plan to resurrect him using gold they claimed from Xorn. Great job James! Ha! What a fantastic story! I'm glad this encounter brought some joy to your table. Ooh! I know! A way to convince my friends that tabaxi aren't the only race i play, and are otherwise good! I'd personally like to see more detail into the life and daily activities of a particular race, or how a particular racial habitat looks and feels like, or even perhaps how a class acts like between races. What are the diffferences between an Elf Fighter and Dwarf Fighter in their respective territories as an NPC? There's a brief summary for each in the PHB of course but I wonder how certain parts of Elven or Dwarven culture works. Perhaps descriptions of a typical city how it might look; like the homes are designed in a certain way, etc. All or none of this might have already been told before elsewhere but I am admittedly ignorant on some points so please forgive anything I don't already know that has already been explained. 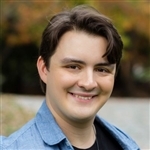 :) Love your articles and this site! More detail on the races could be useful, for instance a while back I wanted to play a Dragonborn with the Noble background, but I had no clue on what a Dragonborn Noble would be like or even if Dragonborn have nobles. It will also be interesting it you went the route of how to play a Dwarf like a Dwarf instead of just a character with +2 to strength and Constitution, cause sometimes it's difficult to figure out how a particular race is different than other races. I think the best place for that information is in a campaign setting. I don't think it does anyone a service for me to explain fantasy stereotypes, do you get what I mean? I don't have much interest in what makes a dwarf dwarfy... I'm more interested in what a dwarf from Little Calimshan in Baldur's Gate is like compared to a dwarf from Mithral Hall. What about a race guide to an actual race being held at an underground gambling ring? Something the PCs need to break up or find a contact in (and probably end up breaking the whole thing up anyways...we all know how PCs do exactly what we think they will.) Could involve dinosaurs from a far off land (or close buy depending on your current campaign). These are really good James. I only wish I hadn't read them so I could have them used against me. Please post more frequently if you have the material. These short encounters are some of best D&D content I have read, they are great to drop into my campaign. I also keep them ready if my players go in a totally unexpected direction. I would love a way to convert them to a printable PDF.